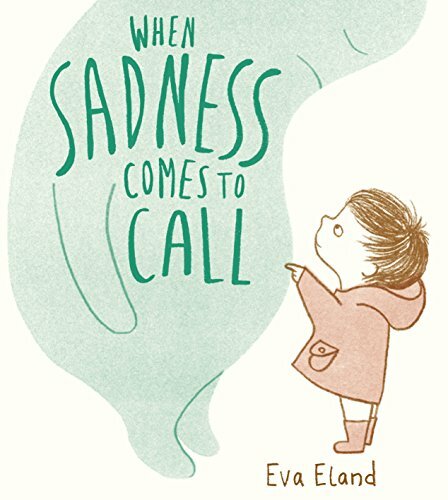 This outstanding picture book approaches the emotion of sadness in a quite unique way. We do not know why the child is feeling sad; the emotion has arrived quite suddenly, with its little suitcase, and appears to be here to stay. The illustrations are all line drawings in brown with splodges of light grey/green colour, one of which is Sadness itself – the other character in the book. The two, the child and Sadness, almost become one, and that is how the child explains the feeling: ‘…it feels like you’ve become Sadness yourself.’ The idea is that the child should embrace this new friend, make it feel loved and nurtured and to do things with it that might make them both happier – like drawing pictures, or drinking hot chocolate, or walking outside. They even sleep together, Sadness cuddling the child like a blanket. There is so much to the pictures, which are simple but full of meaning at the same time, and the tenderness of both illustration and text is remarkable. Lovely and inspiring and quite different, the story could be helpful for children suffering sadness for no particular reason, or for those with depression or sadness at the loss of someone or something very important. Exceptional!